Author: Chris H. Reintges. Series edited by: Wilhelm J.G. Möhlig, Bernd Heine. 24 pp. Roman, 622 pp. 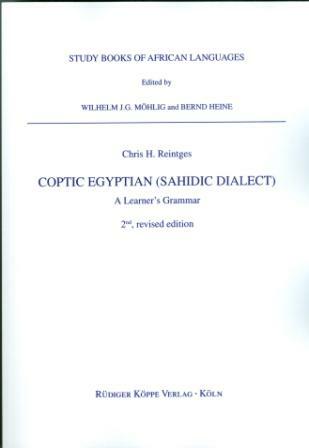 This book offers a comprehensive description of Sahidic, the main reference dialect of Coptic Egyptian. Coptic Egyptian (not to be confused with Egyptian Arabic) is the vernacular of late-antique and medieval Christian Egypt (from about the third to the eleventh century CE) and represents the final developmental stage of Ancient Egyptian. With its rich literary sources, Coptic is an ancient language of great cultural importance. It also provides an interesting case of the emergence of a language through intensive contact (Egyptian-Greek) in a bilingual speech community. For this reason, the study of the Coptic language is of central interest for scientific disciplines as diverse as Egyptology, Ancient History, comparative religion, and various fields of linguistics (e.g. comparative Afroasiatic linguistics, language typology, historical syntax). This studybook therefore has a dual purpose: on the one hand, it serves as a teaching grammar for the language learner by providing an introduction to Sahidic Coptic. On the other hand, it contains the synthesis of extensive research on Coptic clause structure, which makes it a suitable reference tool for philologists and linguists alike. This comprehensive grammar provides an up-to-date treatment of the structure of Sahidic Coptic that is accessible to a broad linguistic and Egyptological readership. It is a data-oriented and strictly synchronic study of the language system. In terms of organisation, it follows the classical model of reference grammars with chapters on phonology, morphology, tense-aspect-mood marking, and clause structure. Designed as an introductory grammar, it comprises a large amount of didactic material which is inspired of modern language teaching. In presenting new analyses for several areas of Sahidic grammar (the deictic system, verb conjugation, clause structure), this book will also be of interest for the Coptological and linguistic specialist. In bringing together Coptic philology, descriptive linguistics, and syntactic theory, it adds an innovative element to the longstanding research tradition on Coptic linguistics. Coptic Egyptian consists of twelve units besides this introduction, which together provide a complete description of Sahidic Coptic grammar. Each unit discusses a separate grammatical topic and is accompanied by a list of key terms and a series of exercises. For the second edition, the manuscript was completely revised and an index added. This is a comprehensive grammar of Sahidic Coptic which is intended both for a serious learner and for philologists and linguists who will use it as a reference grammar especially thanks to its innovating presentation of clause structure. The author is both a linguist and philologist and his grammar is both linguistically sound (and fortunately far from linguistic experiment and terminological confusion) and data oriented. [...] I think it is the best in its class.